Norbert - Who He Is And How He Came To Be! About 18-20 years ago at a comics con, I saw a little kid (okay, a snot-nosed, bow-tied little pillock of a kid) verbally berate Sergio Aragones for not knowing how to draw the Batmobile for him from memory for his sketchbook. 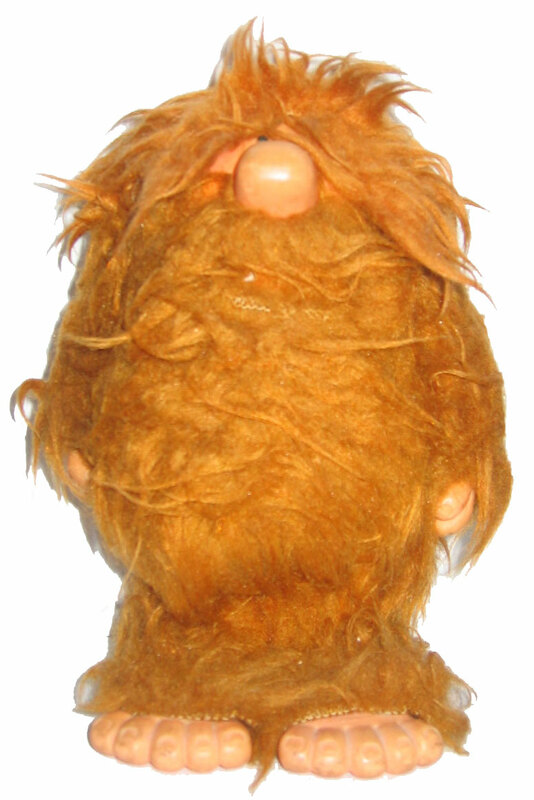 Norbert is a caveman doll (or maybe a Bigfoot...well, he's hairy) I found at a garage sale in my teenage years, and something about him just called to me. I used him as a character in my own art and mini-comics, and he had become my personal mascot and/or totem. He was named after Norbert the Nark from The Fabulous Furry Freak Brothers, for no very good reason other than the name seemed to fit. Close to 2 decades later, I have 3 volumes of sketches from a massive cross-section of the comics game. I got a lot of people on their way "up" - I have a Cully Hamner drawing of Green Lantern Norbert (a recurring theme), J.G. Jones drew him as an edwardian monk, and a pencil sketch of Norbert as The Ray by Joe Quesada - one of these days I'm gonna see if I can get him to ink it for me. Some people went full-goose bozo with inspiration - Val Semiks drew him wearing the Crown of Horns and seated on the throne of Hell (from his delightful Demon run) and Eric Shanower drew him as the Rightful Ruler of Oz. (Of course, I had just presented him with a massive map of Oz I'd drawn in Autocad as a test of a fancy drawing pad, so I guess he felt obligated. A few non-comics artists are there as well - Jim Jinkins (creator of Doug), John Dilworth (Courage the Cowardly Dog) and wrestler Jerry Lawler (a fine artist in his own right) snuck in there too. A few legends have graced the book - Murphy Anderson drew the N-man simply holding one of his trademark signature plates, and Moebius did a two-panel comic that still makes me laugh. I've been at it so long, some of the people in the books have passed on. Marty Nodell drew him with the Golden-Age Green Lantern, and Dave Cockrum drew him as Nightcrawler. At a recent Baltimore con, I got the chance to show a lot of the sketches to their artists as a reminder of how far they've come from their days when they'd draw anything for anybody, as opposed to now when they're getting a hundred bucks a shot, with a waitlist so long you can't even get on the queue. If I (try to) get a Norbert from you, it means I really like (and probably respect) your work, and want to add you to a list of people who have helped make me happier for random periods of time. There's over three hundred people who are now members of the International Norbert Conspiracy, and so far only one has dared to join the Dread Inner Circle, by actually including Norbert in a comic.